At the Los Angeles Auto Show on November 20, Jaguar unveils its new Jaguar F-Type Coupe. Following closely on the heels of the very well received F-Type Roadster, the new Coupe is, to my eyes, the more complete and satisfying design of the two and bears - particularly in the rear - quite a resemblance to the iconic Jaguar E-Type, introduced in 1961. Having seen the new Coupe in the flesh (or rather, in the metal) earlier today at a Jaguar design preview, I can attest it's at once very pretty and chic, yet packed with visual grunt and snarl. Prices begin at $65,000 for the base model, heading north of $100,000 for the raciest top-spec version, with US deliveries beginning next May. 5-liter supercharged V8 engine and will reach 60 mph in 4.0 seconds, and a top speed of 186 mph (electronically limited)2. 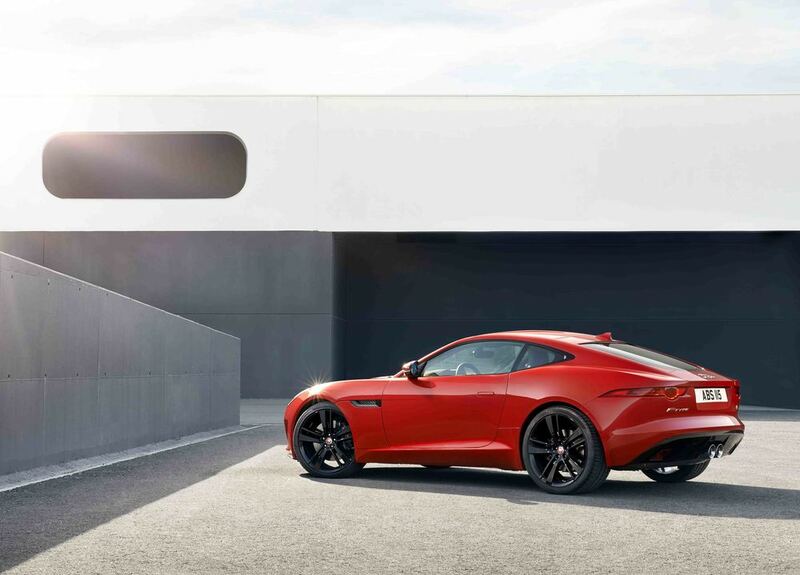 The F-TYPE S Coupe and F-TYPE Coupe are powered by 3-liter supercharged V6 engines in 380hp and 340hp forms respectively, giving 0-60 mph in 4.8/5.1 seconds and top speeds of 171/161 mph2. hydro-formed aluminum alloy beam which runs from the front of the A-pillar through to the back of the D-pillar, through the door opening line and back to the rear quarter window. The F-TYPE R Coupe represents the pinnacle of the F-TYPE range. Powered by a 550hp 5-liter supercharged V8, the F-TYPE R Coupe achieves 0-60 mph in 4.0 seconds2 with an electronically limited top speed of 186 mph, 50-75 mph takes a mere 2.4 seconds. Engaging Dynamic mode delivers firmer damping rates, increased steering weighting, faster gear changes and sharper throttle response. In the F-TYPE R Coupe, Dynamic mode is configurable on the central 8” touchscreen, allowing the driver to save vehicle settings. The eight-speed 'Quickshift' transmission has been recalibrated to make the best use of the 550hp engine in the F-TYPE R Coupe. Its eight, close ratios help to fully exploit the engine’s rev range and ensure that it remains within its optimal power band with every gear change. Manual control is available to the driver at any time, using either the steering wheel-mounted paddles or the central SportShift selector. 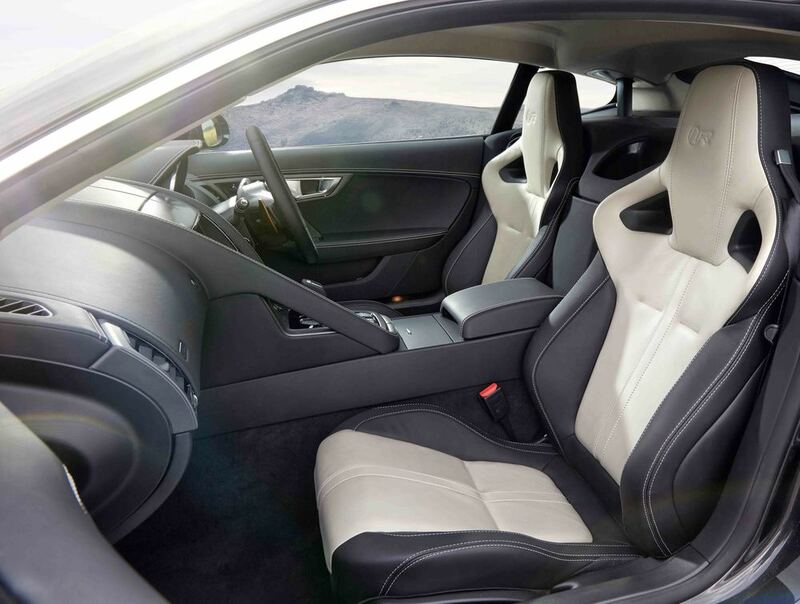 The premium trim in the F-TYPE R Coupe also includes leather on the instrument panel and cluster, armrests, door inserts and the center console. Leather or Suedecloth headliners are optional. The driver focused cockpit conveys its sporting intentions with a small-diameter, flat-bottomed steering wheel wrapped in Jet black leather with the R logo. A round wheel is a no-cost option. Also standard on the F-TYPE R Coupe is the top-spec 770W Surround Sound audio system by British audio experts MeridianTM, as well as heated seats and a heated steering wheel. The F-TYPE Coupe model range is available with two audio systems, both of which come from British audio experts Meridian™. These offer either 10 or 12 speakers with outputs of 380W and 770W respectively. The Meridian systems benefit from digital signal processing to create audio reproduction that is second to none. The top offering features Meridian's proprietary Trifield™ System, which places both occupants at the center of their own perfectly focused surround sound field. All F-TYPE models – Coupe and Convertible – are equipped with an Intelligent Stop/Start system which, when conditions allow, stops the engine from idling when the car comes to a stop and the driver's foot is on the brake pedal. When the brake is released, the system will quickly restart the engine. By reducing idling, the system offers reduced fuel usage and emissions.